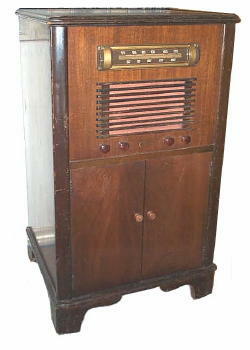 The Warwick Manufacturing Corporation in Chicago produced Clarion radios such as this one. I found my example at a Salvation Army in Virginia. The doors at the bottom are for storing record albums and the phonograph is accessed through the top lid. The performance of the radio was rather marginal for a superheterodyne so it served its function better as a end table instead.